← Caught on camera: A wasp…party? Entomologists study insects. They’re a group of arthropods that have three body segments, two compound eyes, six legs, unmusculated antennae, and a Johnston’s organ. The Johnston’s organ is found in the antennae and is responsible for detecting movement. Generally, insects are our major competitors for our food, our space, and our health. Not only is there a decent amount of money being invested in studying pest species but many people are interested in tackling these larger problems of food shortage and world health. Insects are a means to be able to do that. However, I think insect biology is fascinating and that they’re underrepresented in our school systems and misrepresented in society. So I’m just trying to spread the #buglove. But there as as many reasons to study insects as there are entomologists themselves. Some are interested in genetics, others evolutionary relationships, some ecosystem health, others communication, and some are interested in using insects to improve our own technology. The reasons vary dramatically between entomologists. If you ever meet an entomologist, ask! I’m sure they’d love to tell you about it. 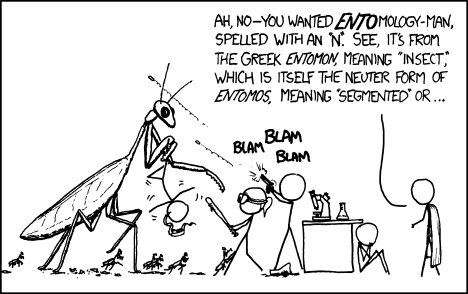 Entomology comes from the Greek worked “Entomos” which means segmented. So it’s the study of segmented things. Studying words is etymology. This XKCD comic sums it up perfectly. Similar to what I stated before entomologists can work in a wide variety of jobs that range from everything to outreach, teaching, research, industry, or even be working in the military. I think entomology is unique in the fact that you can study something specific but apply it to a wide variety of jobs. I’m assuming this is in terms of salary. Grad students can make between $15,000-30,000 a year. Some pest control agents are making minimum wage. Freelance entomologists are all over the place depending on exactly what their doing and how their business is going – but pretty generally I’d say $20,000-50,000 would be a reasonable guess. Same might be true for contractors in industry. Researchers at universities that have tenure might be making $100,000 or more. CEOs of pest control companies might be making in the millions. Again – it’s varied. You can be in a lab coast testing genes or go into someone’s house looking for termites. You can be doing school presentations or setting out traps in a potato field. You can be entering data to learn about complex evolutionary relationships, or you can be staring through a microscope counting the toes of a beetle you’re trying to identify. Entomologists are people! So we wear normal things depending on the circumstance. Every day you’re likely to see me in jeans and a t-shirt but I like getting dressed up too. As for their job – again it varies because entomologists have varying jobs. Sometimes entomologists have to wear lab coats because they’re working with chemicals, sometimes they have to wear field clothes because they’re out setting out traps. Sometimes they have to wear uniforms. Really depends but more often than not we’re dressed casually. Also check out the hashtag #Entofashion to see entomologists rockin’ their favorite bug merch! 2) because characteristics like color or shape are not very useful when trying to ID insects as many are mimics of each other and belong to vastly different groups. One can hurt you, and one can’t. Entomologists have an arsenal of equipment to trap insects. The most basic of which is a simple butterfly or sweep net. D-nets and white pans are mainly used in Aquatic collecting. Pan traps, Berlese Funnels, Pheromone Traps, Light Traps, and Sticky Traps are also all used to collect various arthropods in varios habitats. If you’re interested in collecting – check out our other article to help get you started. How Does a Forensic Entomologist Help Solve Crimes? Forensic entomologists examine insect evidence in relation to crime scenes. Insect growth and development is strictly dependent on the amount of time and the temperature at which they were exposed. By knowing both of these factors, you can calculate how long a body has been exposed to the elements using the species of insects you’ve found, the life stage in which you found the insects and temperature at which they were exposed. This calculation gives you a PMI or Post Mordem Interval. The PMI gives you a rough estimate (days – weeks – months – years) as to how long the body has been exposed. It is not a time of death but is used as an estimate. A forensic entomologist looks at a lot of these. Nancy Miorelli, @SciBugs, is living in Quito Ecuador. To help fund her stay she sells eco-friendly, bug jewelry featuring jewel beetle shells and an Ecuadorian nut called Tagua! Check out her shop SciBugsCollections! This entry was posted in Education, Identification, Pest Management and tagged arthropod, Entomology, Forensic entmology, forensic entomologist, How Do Entomologists Help Solve Crimes, Insect, What Do Entomologists Do, What Do Entomologists Do at a Crime Scene, What Do Entomologists Do Every Day, What Do Entomologists Make, What Do Entomologists Study, What Do Entomologists Use To Catch Insects, What Do Entomologists Wear, What Does Entomology Mean, Why Do Entomologists Study Insects, Why Do Entomologists Use Dichotomous Keys. Bookmark the permalink.